All good things have to come to an end eventually. It is sad that the Olympics came to an end so soon. But truly what a magnificient event for China and the world. What a show of strength, unity and volunteerism. Every Chinese who whole-heartedly worked for this event from sportsperson to the volunteer, from their President to the person who wiped floors of the sports fields, the cheerleaders and most importantly the BOGOC the Beijing Organising Committe for the Olympics games deserved credit. A lot of this success has come with foreign technology but credit has to be given to the Chinese to have pulled off such a wonderful event. 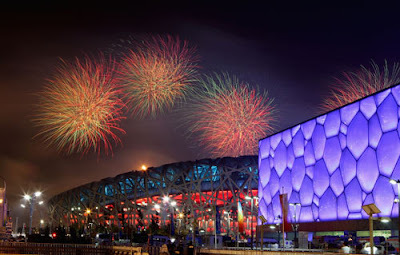 The technology, artistic dances, acrobatics, the incredible firework, the unforgettable Bird's nest stadium and the water cube swimming complex. It was only befitting that China themselves topped the medals tally for the maximum number of Golds won. BOCOG President Liu Qi was presented with the Olympic Order in Gold by IOC President Jacques Rogge in recognition of all the work and effort over the past seven years that made possible this exceptional edition of the Games. I wished Anotonio Samaranch was alive to see how Beijing had defied what he said of the Olympics in Australia. Fourteen other BOCOG officials, including Executive Vice-Presidents Liu Yandong and Chen Zhili and Executive President Deng Pufang, received the Olympic Order in Silver, and Beijing Mayor Guo Jinlong accepted on behalf of Beijing citizens the Olympic Cup from the hands of President Rogge. I was also reminded of what the ousted Romanian Nicolae Ceauşescu of Romania saw when he came to visit China. Unfortunately for him trying to imitate the Chinese might (he saw the army parade) in Romania failed. It was also nice to see Kenya's gold medal in the marathon and to hear their national anthem play in the Bird's Nest just before the Grand Finale events. This Olympics is going to be remembered for Michael Phelps and Umain Bolt. Is there a lesson for India, its neighbour? One individual performance Gold in the history of the Olympics? Sebastian Coe has already said London Olympics will not be on such a grand scale as it was in China. It was nice to see Jimmy Page and the familiar London Bus transforming itself like a Transformer Toy so well in the handing over celebrations. Will I make it for the 2012 Olympics to London? Dream on Subash. How many of you are there with me on this? Following the Summer Olympics, China is all set to host the Paralympics which is due in 5 days (Sept 6- 17). Check the official site at http://en.beijing2008.cn/paralympic/.